Utilizing solar panels is a recognized way to harness renewable power from the sun. But in Canada and other northern climates, the effectiveness of solar panels in the winter months is reliant on removing obstacles like snow and ice. That is the challenge faced by researchers from UBC Okanagan’s School of Engineering. 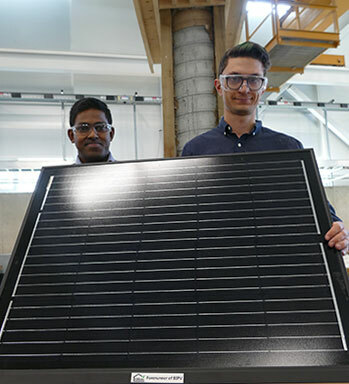 Graduate students Remy Kennedy-Kuiper and Tharaka Wanniarachchi, guided by professors Shahria Alam, Rehan Sadiq, Kasun Hewage and Jian Liu, are pursuing a Mitacs-funded initiative in partnership with Create Green Consulting, a Kelowna-based sustainable energy industry partner. Kennedy-Kuiper is working on a snow-melting system for solar panels that will provide electricity to a newly renovated home in Kelowna. The system will ensure that the solar panels are clear of snow and ice and will work year-round. The solar panels will be used in combination with a recently-installed Building-Integrated Photovoltaic (BIPV) heating system for the home, which harnesses passive solar energy. Engineering graduate students Tharaka Wanniarachchi and Remy Kennedy-Kuiper are working on a system to keep solar panels clear of ice and snow so they work effectively during winter months. Kennedy-Kuiper believes the solution lies in deploying some of the generated solar energy into a snow-melting mechanism, employed along the roof and solar panels. “We are investigating the efficiency of melting rates and energy requirements at different temperatures to uncover a system that is both efficient and effective,” he says. Using the home as a living lab, Wanniarachchi is assessing the efficiency of the BIPV system. The solar panels will provide electricity to the house while solar heat collectors will help keep the house warm during cold winter months. New efficient homes and buildings are rapidly adopting such renewable energy systems for heating and cooling. This shift to alternative energy sources like solar is reducing greenhouse gas emissions originating from older, conventional heating technologies such as electric and oil furnaces, explains Wanniarachchi. Converting solar energy to electricity can lead to power generation that is 15 per cent efficient, however, solar energy to heat conversion rates can lead to higher efficiencies. This is one reason Create Green is pursuing the solar heat collectors to generate thermal energy. The thermal energy will be stored in a large water reservoir, constructed within the lowest floor of the living lab. The energy storage system will then release heat at a controlled rate throughout the house. As the project continues, the researchers will analyze the effectiveness of the system over the winter and adjust if needed. This initiative has the potential for large-scale usage across Canada and other countries with similar climates, and will further advance the field of green energy research, says Wanniarachchi. The research is funded by Create Green Consulting and accelerate grants from Mitacs, a national non-profit research and training organization.